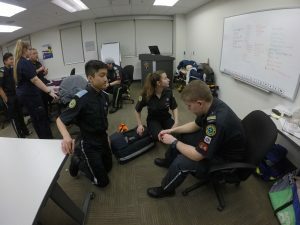 The 1st Newmarket Medical Venturers and Rovers are a themed-Scouting group that specializes in health care and emergency response, with a focus on Paramedicine. We meet weekly on Monday nights to train in first aid, outdoor skills, leadership, and plan new adventures. We also spend several weekends a year at camps training and practicing our skills. 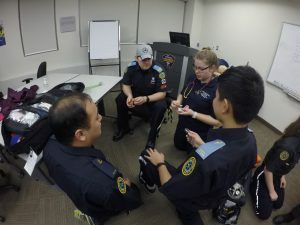 We then attend Scouting and community events to provide volunteer first aid service and work with our sponsor York Region Paramedic Services to provide public education. Our program is for youth ages 15-26, supported by adult volunteers of all ages. We meet weekly on Mondays at the York Region Paramedic Services Headquarters, located at 80 Bales Drive East in Sharon. If you are interested in joining the 1st Newmarket MedVents, please send an email to info@newmarketmedvents.ca expressing interest. We are currently recruiting for January 2019, so will get back to you with more information and what the process will be for joining. We will then invite you to come to join in on a meeting to see how you like our group, and if you believe it is a good fit for you we will start the enrolment process! Scouting began in 1907 when Lt. Gen. Robert Baden-Powell of the British Army took a group of youth to a camp on Brownsea Island in the United Kingdom. There is evidence that a few Scouting groups started up in Canada in 1907. The Canadian General Council of the Boy Scout Association was incorporated by an act of the Canadian Parliament on June 12, 1914. In 2007, our Centennial Year, our name was officially changed by an act of Parliament to Scouts Canada. Since 1910 the Governor General has been either the Chief Scout for Canada (prior to 1946) or Chief Scout of Canada (after 1946). The current Governor General and Chief Scout is His Excellency David Johnston. Today, over 100 years later, Scouts Canada is a highly diverse organization with over 100,000 members nationwide representing every faith and culture. Scouts Canada offers programming in more than 19 languages reflecting Canada’s multicultural landscape and communities. Copyright 2018. 1st Newmarket MedVents. Corporate WordPress Theme.